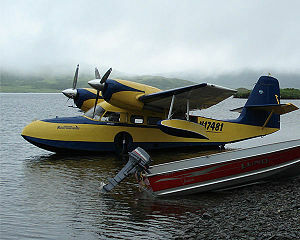 The Grumman G-44 Widgeon is a small, five-person, twin-engine amphibious aircraft. (See FAA Type Certificate Number A-734; aircraft is designated a "5 PCL-Am-FbM" which means it is a 5-place Cabin Landplane-Amphibian-Flying Boat Monoplane.) It was designated J4F by the United States Navy and Coast Guard and OA-14 by the United States Army Air Corps and United States Army Air Forces. The first prototype flew in 1940, and the first production aircraft went to the United States Navy as an anti-submarine aircraft. In total, 276 were built by Grumman, including 176 for the military. During World War II, they served with the US Navy, Coast Guard, Civil Air Patrol and Army Air Force, as well as with the British Royal Navy, who called it the Gosling. On August 1, 1942, a J4F-1 flown by US Coast Guard Patrol Squadron 212 based out of Houma, Louisiana and flown by Chief Aviation Pilot Henry White spotted and attacked a German U-boat off the coast of Louisiana. White reported the submarine sunk, and he was subsequently credited with sinking U-166 and awarded the Distinguished Flying Cross. However, the wreck of U-166 was found sitting near the wreck of SS Robert E. Lee in June 2001 by an oil exploration team working for BP Amoco and Shell Oil Company. The sinking of U-166 on July 30 (that is two days before the Widgeon flight) is now credited to PC-556 patrol craft escorting the Robert E. Lee. White's Widgeon is now thought to have made an unsuccessful attack against U-171, a Type IXC U-boat identical to U-166 that reported an air attack coincident with White's attack. U-171 was undamaged by White's attack, but was sunk four months later in the Bay of Biscay. After the war, Grumman redesigned the aircraft to make it more suitable for civilian operations. A new hull improved its water handling, and six seats were added. A total of 76 of the new G-44A were built by Grumman, the last being delivered on January 13, 1949. Another 41 were produced under licence by the Societe de Construction Aero-Navale (SCAN) in La Rochelle, France as the SCAN-30. Most of these ended up in the United States. McKinnon Enterprises at Sandy, Oregon converted over 70 Widgeons to "Super Widgeons." The conversion features replacing the engines with 270 hp (201 kW) Avco Lycoming GO-480-B1D flat six piston engines, and various other modifications, including modern avionics, 3-bladed propellers, larger windows, improved soundproofing, emergency exits, and increased Maximum Takeoff Weight. Retractable wing-tip floats are optional. Main production variant, 200 built including military variants listed below. Improved post-war production variant with redesigned hull, 76 built. G-44 for the United States Coast Guard with three seats, 25 built. United States Navy version of the J4F-1 with 5-seat interior, 131 built. Fifteen G-44s impressed into wartime service with the United States Army Air Force. One new aircraft for the Corps of Engineers. G-44 Licence-built in France, 41 built. Many Widgeons survive in private hands, in various states of restoration or storage. The aircraft continues to enjoy a considerable degree of popularity as a seaplane with many still being flown regularly, though rarely on the warbird circuit. G-44 (reg. # CF-ODR) is on display at the Canadian Warplane Heritage Museum in Hamilton, Ontario. G-44 (N13122) is on display at the Alaska Aviation Heritage Museum in Anchorage, Alaska. Several G-44 are on display at museums in Portugal and France. G-44A (cn 1449) on display at Royal Thai Air Force Museum, Don Muang AFB. Ze plane! Ze plane! is a Grumman Widgeon (N4453) seen in the opening scenes of the television series Fantasy Island delivering guests to the island. Though it has a checkered past including drug smuggling and a provenance that includes Richard Bach, it survives in the collection of an antique dealer in Hollister, Missouri and is hangared at M. Graham Clark Field, Taney County Airport. Taylor, John W. R. Jane's All The World's Aircraft 1976-77. London: Jane's Yearbooks, 1976. ISBN 0-354-00538-3. Grumman Widgeon Pictures and Grumman Widgeon for Sale.